"Welcome To Clickbanks #1 Muscle Building Program. Write Your Own Pay Check By Earning Up To $120.34 A Sale On This Incredibly High Converting Offer & Get Paid Every 15 Days Like Clockwork from Clickbank"
provided in my tools section. 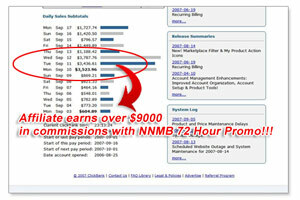 One affiliate made $+9,000 in 72 hours!!! Well, if you have been looking for a successful online muscle-building program, then your very lucky you made it here, because… I am the bestselling muscle-building affiliate program for skinny guys on the entire Clickbank marketplace as well as one of the top 5 products in the entire Health & Fitness marketplace. I offer the largest single commission payout of 75% compared to any other muscle building e-book online. Do you have a health and fitness, nutrition, supplement, muscle building or bodybuilding related website, newsletter, blog, forum or e-zine? Do you know friends, family, or colleagues that want to build a super muscular body in less time? You don't need to subscribe to the newsletter to become an affiliate but if you plan on marketing successfully and staying ahead of your competition then I would recommend staying in contact with me so that I can update you with new techniques and tools I learn to help you improve your marketing campaign constantly. Don't worry, every email I send will be loaded with content and new money making tips as well as special announcements. I will not send random emails and fill your Inbox with useless information. Simply fill out your first name and email address above and you'll be immediately signed up to receive all of my marketing tools, tips and resources to start making money online. You will also be notified of special announcements and promotion opportunities before anyone else (only announced to No Nonsense Affiliates). 4. Read the entire FAQ section located in our Affiliate Profit Center please before emailing any questions. Let's say you did only 1 measly basic package sale a day (which is super easy by the way)… that works out to an extra $1,500+ a month…that should take care of your car payment or maybe even mortgage payment each month! month if you sell the basic package plus the two 1-click upsells after checkout! To be honest, you are in complete control of how much you make therefore you write your own pay check! There is really no limit to what you can earn. The more motivated and aggressive you are in promoting my product, the more money you pocket. It's a simple system. 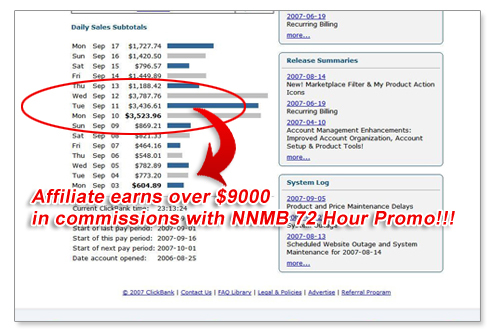 The more tools you use and the more traffic you can send to my site, the larger your pay check! You earn 75% on each sale which works out to up to $120 PER HOP! As you can see, these sales can really add up over the long haul. To date, I currently convert just under 2% (industry average is 1%) of visitors to my site. However, affiliate traffic typically converts much higher. Third party reviews (that's you) who can 'pre-sell' the program from their own website have a astounding 3-5% conversion rate! Refund rates are extremely low as well mainly because I do a excellent job following up with all my customers every few days, for the first few months, to ensure they are satisfied. ClickBank sells our products - they are a trusted online retailer specializing in digitally delivered products. Clickbank is the 3rd party company that handles all credit card transactions as well as the affiliate program tracking. They accept every type of credit card as well as Paypal and E-Checks in 100 different countries and use the strongest security and best anti-theft fraud in the world. Here is my vision for both of us: the more sales you generate, the more exposure and popularity I gain on the Internet the greater the growth of my program. The greater the growth of my program, the bigger your pay check! It's a beautiful thing! The harder we both work, the faster we will both achieve our business and financial goals! You may also visit my link generator to have your link generated for you or to generate a hop link that will direct traffic to other landing pages found on our site. Make sure you create this link correctly or else you will not receive credit for your sales! If someone requests a refund after their purchase then you will not get commission on that sale. Don't worry; the refund rate is extremely low so this rarely happens. Create your own targeted muscle building site or blog. Be very specific to your audience. You might want to target females only, males over 40, male teenagers or advanced trainees. This will make your marketing efforts easier. Have a link to my video coaching lessons and comment on it. Give away from Insane Muscle Gain E-Report. It does not make complete sense to me but that's the way it is so accept you'll win some and lose some. You're probably “stealing” others commissions just as much as they are “stealing” yours but don't look at it as “stealing”. If you were to go shopping for a shirt and didn't buy the shirt you like until the fifth store you went into, does that first store deserve to get a piece of the commission? Did that fifth store steal the sale? I personally don't think so. The last site was the one that finally convinced them to buy so they get the full reward. I understand this is not a black and white issue but don't let this hold you back from making your first sale because you could be missing out on a boatload of commissions while you twinkle your thumbs. Don't let this hold you back, it's fair game for everyone and is really not something you need to worry about. As of Saturday August 29th, 2009 No-Nonsense Muscle Building has included 1-Click Upsell technology which allows additional products to be sold to a customer during the purchase flow. 1-Click Upsell gives us the power to further monetize a single Hop as affiliates earn commissions on the upsell purchases. Note: This 1-Click Upsell feature is only provided to qualified vendors, (Yes, that's me :) ) who have met extensive Clickbank standards and requirements. Less than 1% of Clickbank products even have access to this software which is boosting conversions like crazy and allows you to spend more on your marketing. However, the additional revenue will NOT show up in the average payouts on the Clickbank Marketplace because not everyone has access to this software so my ranking would get an advantage over other publishers which is not fair. It IS live and it IS working so muscle up your campaigns starting today. You will now earn an additional $34.00 or $13.00 and $33.00! There are 2 different offers and each one has a downsell. Everyone sees both offers through the flow. So you can earn up to an additional $67 PER HOP! Let's look at the net opportunity for you: $53 ($77 package) + $67 (both one-time-offers) = $120 total ! I pay out the fattest commission on the Health & Fitness Marketplace by a long shot! Since this is brand new I don't have conversion numbers but they will be released soon via this newsletter. Is there a marketer teaching this because I got about two dozen emails on this question in one week, out of nowhere! …but wait. Right before you were about to hand over your credit card the sales man starts rambling again about how great the car is, how the engine runs, the beautiful rims, brand new stereo system blah blah blah! Chances are you would be so annoyed with the car sales man re-selling you AFTER you are already sold! I wouldn't be surprised if you changed your mind on the spot and walked out. You were going to give the salesman your business but he pissed you off at the last second and lost your business. I see this happen all the time with affiliate marketers. They create landing pages that try to sell my product and that is NOT your job. That's my websites job. It's already a highly converting, professionally direct-response marketing letter. Yeah, that's completely cool and I totally recommend bringing your landing pages to life with powerful images that represent the topic you're speaking on. However, if you're promoting drug free bodybuilding don't put images of juiced up bodybuilders because it will distort your message. Pictures of food, me, product covers, exercise demos, celebrities, attractive men (i.e. me :) ), women (especially) and pictures that represent what the customer wants are best. For example, a picture of a dude with two hot women hanging onto his arms would be a powerful image. Read the entire FAQ section located in the Affiliate Profit Center please before emailing any questions. So if you have questions or concerns, contact Vince DelMonte's Help Desk and I will respond within 24-48 hours. To Literally Start Earning Cash Overnight, Make Sure You Sign Up For My FREE Affiliate Newsletter Before You Go Any Further! I will never ever give your email address to anyone for any reason. I hate spam and will never be apart of it! Your email address was successfully subscribed to Affiliate Newsletter. You should be receiving your first email from us very shortly.